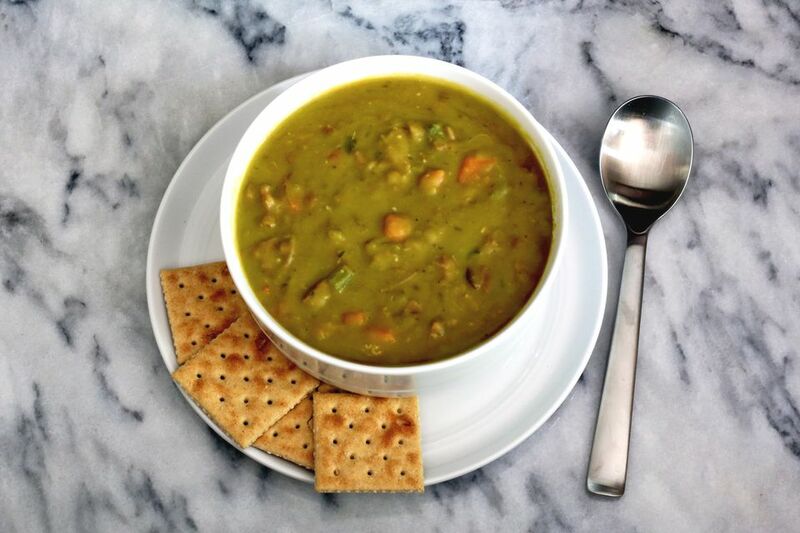 Split pea soup is pure comfort food for many and it's surprisingly easy to make at home. All you need is a slow cooker, a ham bone or ham hocks, peas, and a few veggies. Get it started in the morning, let it cook slowly all day, and it's ready for dinner. The magic of split pea soup is that the peas are so small that they melt into a thick slurry as they cook. This creates the comforting texture that makes this traditional dish so enjoyable. Their size also makes them easy to cook, which is why there's no need to soak them like you would dry beans. As this recipe proves, split pea soup is anything but boring. This version gets additional flavor from garlic, bay, and parsley, along with a little pepper. You can change up the veggies and top it with a variety of garnishes, from parsley to croutons and bacon to sour cream. These little additions will set it over the top and create a perfect meal the entire family will love. Additionally, you can blend the finished soup for a smooth texture or mash the lentils and vegetables with a potato masher for a chunkier soup. Enjoy this satisfying, stick-to-your-ribs soup with freshly baked cornbread or a good, crusty French bread. In a slow cooker, layer the ingredients in the order given; add the water or stock. Do not stir the ingredients. Cover and cook on high for 4 to 5 hours or on low for 8 to 10 hours until peas are very soft and the ham falls off the bone. Remove the meat from the bones and chop. Save some of the chopped ham for a garnish, if desired. Remove the bay leaf. Before serving, mash the peas slightly to thicken the soup or blend the soup in batches for a smoother texture (safety tips below). If you use low-sodium stock or broth, make sure to taste the soup and add the seasoned salt about an hour before it's ready. Also, keep in mind that some vegetable broths will darken the soup a bit. If you are looking for a bright green or yellow soup, use a light color broth or all water. Steam from hot soup and other liquids can create enough pressure to blow the lid off a blender. To prevent the mess and possible burns, never fill the blender more than half full of hot liquid. Loosen the center cup in the blender lid and place a folded kitchen towel over the top; hold it down firmly and blend. Split peas are merely dried peas that are cut in half. You will find both yellow and green varieties, though green is more common. The yellow split peas have a mild flavor, and they do make an interesting soup as well. Feel free to vary the vegetables. Almost any veggie can be added to the soup, particularly cubed potatoes or parsnips. You can also simply add more onion and carrots. Garnish the pea soup with croutons, some of the diced cooked ham, cooked crumbled bacon, or fresh parsley. Try serving it with a swirl of olive oil, greek yogurt, or sour cream. Crumbled fried onion rings, freshly grated carrots, or chopped scallions are nice additions as well. If you don't have a slow cooker or want to make it more quickly, you can also make a stovetop pea soup with ham. This soup is also delicious when made with shredded pork picnic (smoked pork shoulder). Or, you can brown some diced smoked sausage in a skillet and add it to the soup about 20 minutes before it's done. Andouille sausage split pea soup is another excellent choice that has a spicier profile.